Is Amgen, Inc. (AMGN) A Good Stock To Buy? It seems that the masses and most of the financial media hate hedge funds and what they do, but why is this hatred of hedge funds so prominent? At the end of the day, these asset management firms do not gamble the hard-earned money of the people who are on the edge of poverty. Truth be told, most hedge fund managers and other smaller players within this industry are very smart and skilled investors. Of course, they may also make wrong bets in some instances, but no one knows what the future holds and how market participants will react to the bountiful news that floods in each day. The Standard and Poor’s 500 Index returned approximately 5.7% in the 12 months ending October 26 (including dividend payments). Conversely, hedge funds’ 30 preferred S&P 500 stocks (as of June 2018) generated a return of 15.1% during the same 12-month period, with 53% of these stock picks outperforming the broader market benchmark. Coincidence? It might happen to be so, but it is unlikely. Our research covering the last 18 years indicates that hedge funds’ stock picks generate superior risk-adjusted returns. That’s why we believe it isn’t a waste of time to check out hedge fund sentiment before you invest in a stock like Amgen, Inc. (NASDAQ:AMGN). Is Amgen, Inc. (NASDAQ:AMGN) a good stock to buy now? Investors who are in the know are betting on the stock. The number of long hedge fund positions improved by 3 recently. Our calculations also showed that AMGN isn’t among the 30 most popular stocks among hedge funds. Today there are tons of formulas investors can use to assess publicly traded companies. A couple of the most innovative formulas are hedge fund and insider trading sentiment. Our experts have shown that, historically, those who follow the top picks of the top hedge fund managers can outpace their index-focused peers by a solid amount (see the details here). Let’s take a gander at the new hedge fund action surrounding Amgen, Inc. (NASDAQ:AMGN). How have hedgies been trading Amgen, Inc. (NASDAQ:AMGN)? Heading into the fourth quarter of 2018, a total of 42 of the hedge funds tracked by Insider Monkey held long positions in this stock, a change of 8% from one quarter earlier. 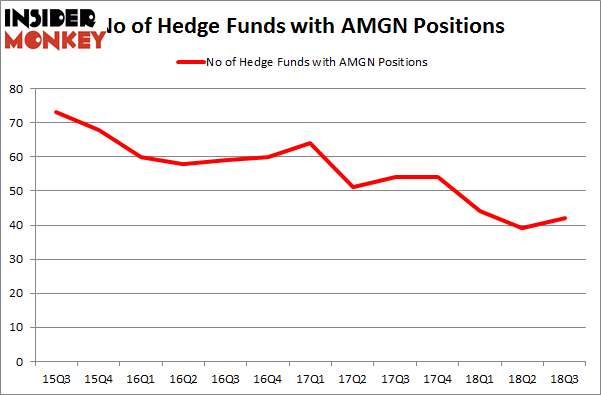 On the other hand, there were a total of 54 hedge funds with a bullish position in AMGN at the beginning of this year. So, let’s see which hedge funds were among the top holders of the stock and which hedge funds were making big moves. More specifically, Renaissance Technologies was the largest shareholder of Amgen, Inc. (NASDAQ:AMGN), with a stake worth $853 million reported as of the end of September. Trailing Renaissance Technologies was AQR Capital Management, which amassed a stake valued at $393.9 million. Two Sigma Advisors, Pzena Investment Management, and GLG Partners were also very fond of the stock, giving the stock large weights in their portfolios. As industrywide interest jumped, specific money managers were leading the bulls’ herd. Polar Capital, managed by Brian Ashford-Russell and Tim Woolley, created the biggest position in Amgen, Inc. (NASDAQ:AMGN). Polar Capital had $129.8 million invested in the company at the end of the quarter. 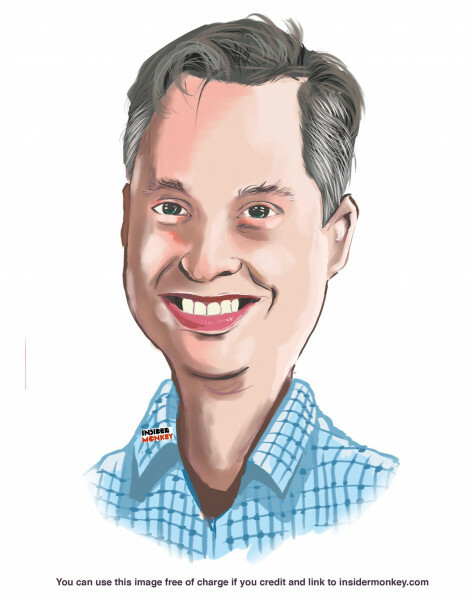 Efrem Kamen’s Pura Vida Investments also made a $6.3 million investment in the stock during the quarter. The following funds were also among the new AMGN investors: David Costen Haley’s HBK Investments, Michael Castor’s Sio Capital, and John Brandmeyer’s Cognios Capital. Let’s check out hedge fund activity in other stocks similar to Amgen, Inc. (NASDAQ:AMGN). We will take a look at Medtronic plc (NYSE:MDT), BHP Group Limited (NYSE:BHP), Adobe Inc. (NASDAQ:ADBE), and McDonald’s Corporation (NYSE:MCD). This group of stocks’ market values resemble AMGN’s market value. As you can see these stocks had an average of 47.25 hedge funds with bullish positions and the average amount invested in these stocks was $3.05 billion. That figure was $2.89 billion in AMGN’s case. Adobe Systems Incorporated (NASDAQ:ADBE) is the most popular stock in this table. On the other hand BHP Billiton Limited (NYSE:BHP) is the least popular one with only 19 bullish hedge fund positions. Amgen, Inc. (NASDAQ:AMGN) is not the least popular stock in this group but hedge fund interest is still below average. This is a slightly negative signal and we’d rather spend our time researching stocks that hedge funds are piling on. In this regard ADBE might be a better candidate to consider a long position. Billionaire Leon Cooperman’s New Stock Picks Here is What Hedge Funds Think About Movado Group, Inc (MOV) HMI Capital’s Returns, AUM and Holdings Is MGM Resorts International (MGM) A Good Stock To Buy? Simcoe Capital Management’s Returns, AUM and Holdings Is Mohawk Industries, Inc. (MHK) Going to Burn These Hedge Funds?